yesterday i was walking thru the living room and happened to notice how totally relaxed Mr Mac was..... look at him... almost comatose!!! i lifted a paw, let it fall, i gently touched his nose, i ruffled the hair on his head... this dog was in a state of relaxation i don't think any human could even imagine achieving. This is so cute & funny b/c we have a mini poodle who does the SAME thing. Loves the top of the couch, as if he's a cat. 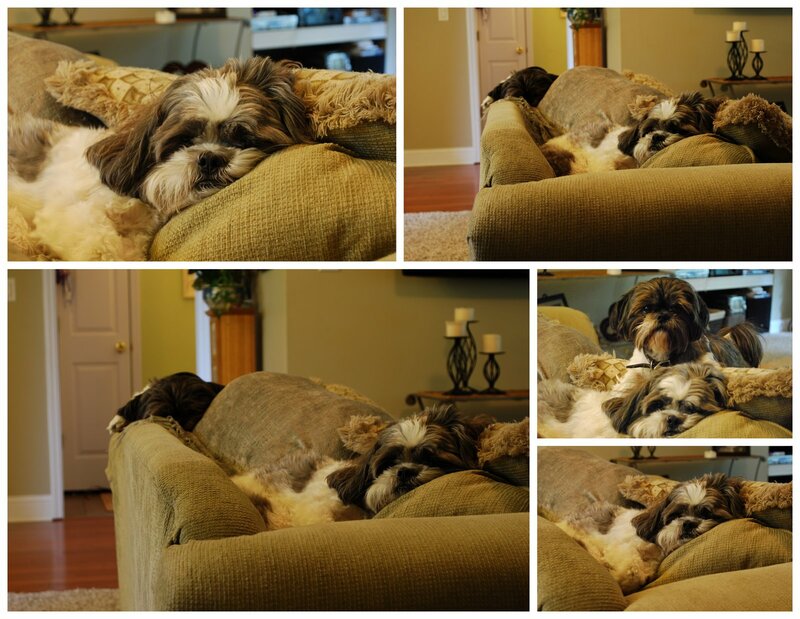 You've done a wonderful job capturing the essence of lazy (although loving and precious) puppies~! I would LOVE to sleep like that!!!! Just veg and nothing could bug you. Oh my gosh that is adorable :) Are those dogs good with kids? My kids are begging for a new pet and I'm half thinking of giving in. Julia... yes they are awesome with the kids and always have been. We got Mac first and loved him so much we got Daisy six months later, she's his sister from another litter!! hee hee. I highly recommend them, and they don't shed which is the best thing of all!!!! They sound perfect!! If we get one I'll be stopping by with all kinds of questions ha ha.